Beginners may register at the open house or online by August 11. New students with prior Arabic language experience should take a placement evaluation at the open house on August 11, 2018. Returning students may register online or by mail before the deadline of August 11th. 10% discount is offered for the 3rd registered child of the same family, and 20% for other additional children. Registration and placement tests are scheduled one week before the beginning of a semester. Placement tests are given to all new applicants (adults & children) who learned some Arabic in the past. They consist of a 15 minutes conversation, reading, or writing and are given on registration days, free of charge. All registrations must be completed by the Open House date set before each semester. Tuition should be paid in full at the time of registration, by check, cash or credit card (Visa or Master Card). Tuition is non-refundable the day following the first class and may not be transferred to another semester. Return check fee is $25. The Alif Institute is not responsible for classes missed due to student absence. Textbook costs are not included in tuition except when indicated. Classes are filled on a first come, first served basis upon receipt of full payment. Cancellation of a class due to insufficient enrollment will be made three business days before the first class. The Alif Institute reserves the right to cancel, change schedules, change ‘age range’ for children classes, fees/tuition, and instructors as necessary. Returning students may register online or by mail before the deadline of each session (the deadline is typically the date of the Open House set before each semester). New students may register on site at the Open House, especially if an placement test is required to assess the class level. All students must become Alif members. 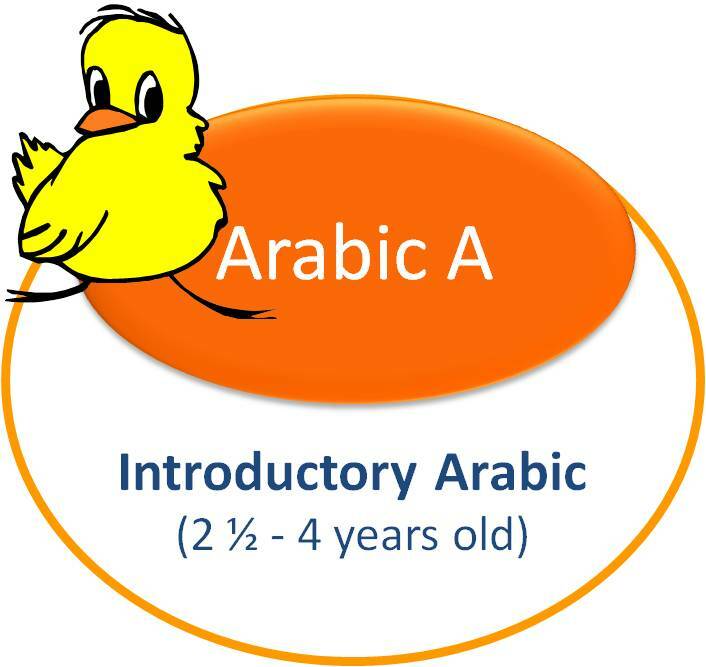 Arabic classes, for toddlers and children, incorporate both classical and spoken language. Alif’s highly trained instructors create a unique learning experience with a culturally nurturing environment and the use of modern technology in the classroom. Following the academic classes, a weekly session of “Arabic Arts & Crafts” is offered free of charge to our students to enhance their language and culture learning experience. In addition, a special program is presented by the students at the end of each semester. The Haflatuna, حفلتنا program features sketches, songs, dances, or poems performed in Arabic. Parents may bring a snack and a drink for their children. Alternatively, they may bring some change to purchase snacks/drinks at the price of $0.50. 2 membership options for students under 18. Students will have to purchase textbooks and educational materials. This class exposes your child to the Arabic language and culture through fun activities, songs, games, stories, and small crafts. No textbook is used in this class. Please note that the children need to be toilet trained. We prefer that a parent accompanies a child during class. Over two semesters, this class introduces the Arabic Alphabet and enables the student to identify and copy the Arabic letters in their independent forms. By the end of this class, students will be able to use basic greetings, say their names, count and say their age, talk about themselves and their families, use common expressions and comprehend basic classroom directions. In addition they learn some vocabulary related to various topics such as clothes, colors, sizes, body parts, fruits and vegetables, Arabic breakfast and drinks, classroom objects, animals, nature and means of transportation. "A Bouquet of Letters & Numbers - K1", "( باقة حروف و أرقام : روضة أولى (الفصل الأول و الثاني " by a team of authors. 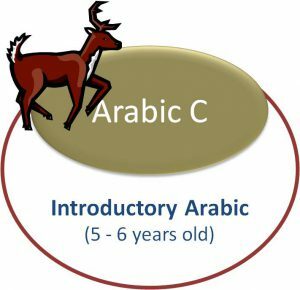 Over two semesters, it introduces the various shapes of the Arabic letters and enables the student to identify, sound and copy these letters in their initial, medial, and final positions. This class is offered to Kindergarten students. 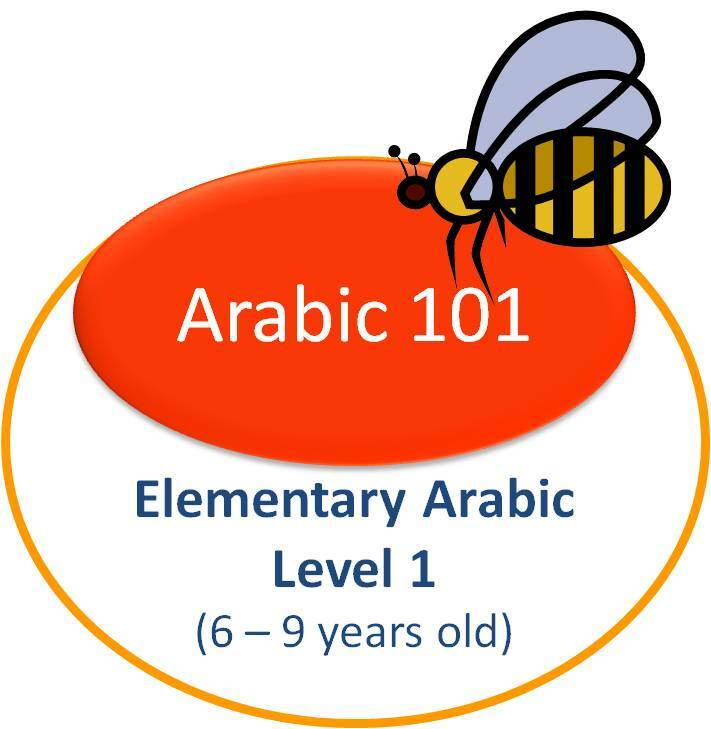 Over two semesters, it introduces the various shapes of the Arabic letters and enables the student to identify, sound and copy these letters in their initial, medial, and final positions. Also they will be able to recognize and sound the short and long vowels. By the end of this class, students will be able to use basic greetings, some courtesy words, say their names, count and say their age, express agreement and disagreement, use common expressions, comprehend basic classroom directions, and make simple requests. Students will also be able to provide simple responses based on familiar topics such as health, feelings, family, clothes, colors, sizes, body parts, fruits and vegetables, Arabic breakfast and drinks, dining utensils, classroom objects, animals, nature and means of transportation. The days of the week and seasons, and singular subjective pronouns will be introduced as well. "Rowad AlArabya: Level 2", "رواد العربية" by Ghada Musa. 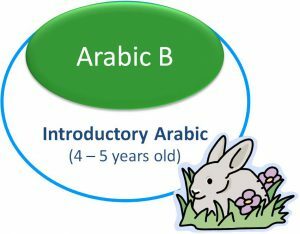 By the end of this level (two semesters) students will be able to recognize the Arabic letters, pronounce correctly all Arabic sounds, and be able to read simple words and short phrases. 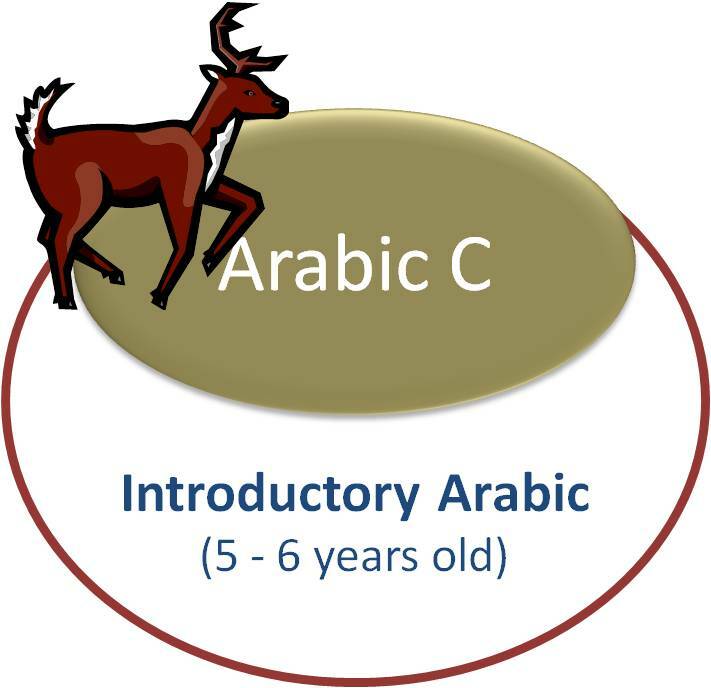 This class is offered to (6 years old) students who complete Arabic C at Alif Institute. It is also offered to (8 - 9 years old) students with no prior exposure to Arabic. 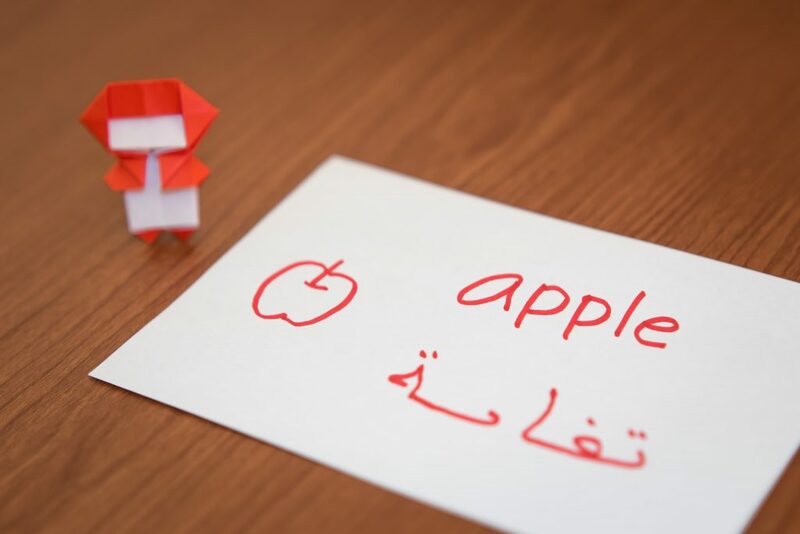 By the end of this level (two semesters), students will be able to recognize the Arabic letters, pronounce correctly all Arabic sounds, and be able to read and write simple words and short phrases. Besides learning all letters, 10 extra-alphabetical symbols are introduced. In addition to developing the reading, writing, and vocabulary skills, students will learn more greetings, farewells, and some courtesy words. They will also learn the numbers and be able to tell their age, express agreement and disagreement, likes and dislikes and use common expressions. They will start sharing some information about self such as: my age, my family, my friends and my school. Students will start using question words, some demonstrative and subjective pronouns, and some simple verbs in the present tense. Also some new topics taught in context are introduced such as: my house, my garden, meals, feelings and emotions, and jobs and professions. A complete set of educational materials developed by Alif Institute specifically for this level. 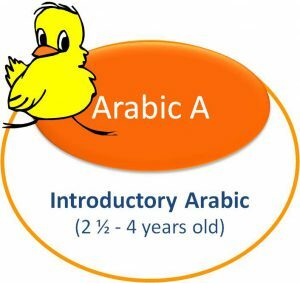 By the end of the level (two semesters), students will have mastered the Arabic Alphabet and are able to recognize and pronounce correctly all Arabic letters. 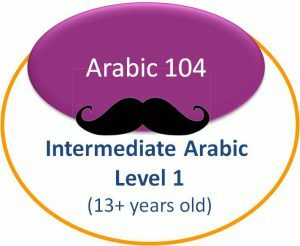 This class is offered to students who complete Arabic 101- Elementary Arabic or its equivalent. By the end of the level (two semesters), students will have mastered the Arabic Alphabet and are able to recognize and pronounce correctly all Arabic letters. They will be able to read and write accurately short sentences using familiar vocabulary, speak in the present tense and begin using the past tense, learn about the gender of words, the definite article, adjectives derived from nouns, how to use various types of questions, subject and demonstrative pronouns, plurals, and nominal sentences. Students will be able to ask for basic information, answer simple questions about themselves, their friends and family, and be able to comprehend simple print and audio/video texts on familiar topics. Students will be able to engage in conversations in a variety of topics including: time, days of the week, months, wetaher and seasons. Also students will be able to participate in culturally-authentic simulations such as holidays celebration, shopping for food and clothese, sports activities and daily routine. 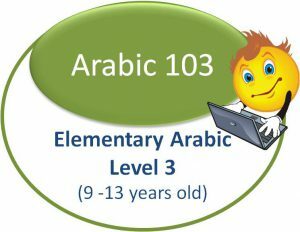 “The Exciting Reading: Level 2", "القراءة المُشوِّقة: الجزء الثاني " , by a team of authors. By the end of the level (two semesters) they will be able to write sentences using familiar vocabulary with emphasis on Arabic sentence structure and basic grammar. 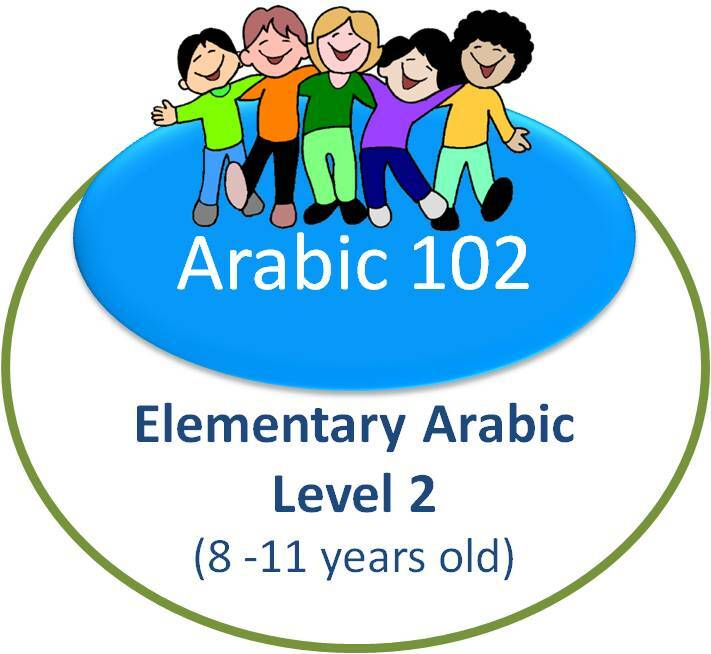 This class is offered to students who complete Arabic 102- Elementary Arabic or its equivalent. 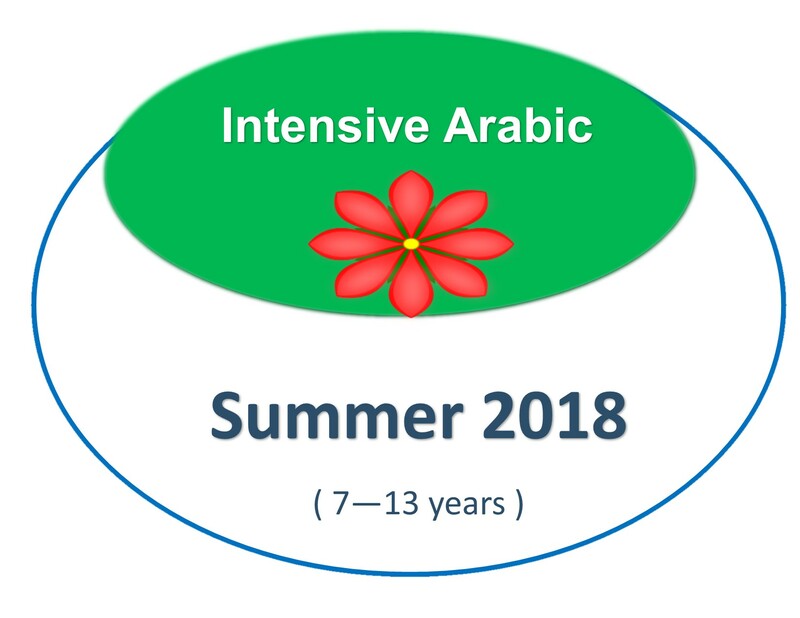 By the end of the level (two semesters), they will be able to read and write sentences using familiar vocabulary with emphasis on the basic Arabic sentence structure, speak in the present tense and begin using the past and future tenses, how to use various types of questions, subject and demonstrative pronouns, plurals, and nominal sentences. THey will be are able to write simple sentences about familiar topics. By the end of the level (two semesters), They will be able to read and write simple phrases and sentences about familiar topics and experiences by using the present, past and future tenses. 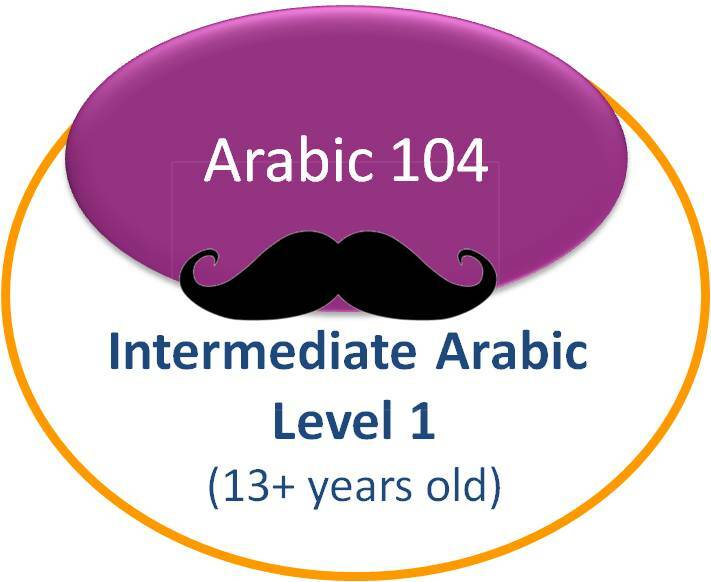 This class is offered to students who complete Arabic 103- Elementary Arabic or its equivalent. By the end of the level (two semesters), They will be able to read and write simple phrases and sentences about familiar topics and experiences by using the present, past and future tenses. Students demonstrate some proficiency in listening and reading comprehension, use the singular, dual and plural nouns, and are able to write simple sentences about familiar topics. Also students will be able to order a drink at a coffee shop and food at an Arabic restaurant, learn about Arabic food and pastries, accept an invitation, shop for clothes. Students are introduced to Arabic traditional costumes, currencies, movies and music instruments. They will be able to make phone calls, shop at the mall, go to the swimming pool. communicate with the doctor and pharmacist and use some basic correspondence. Students will be able to discover the Arab culture through stops in different Arab countries. 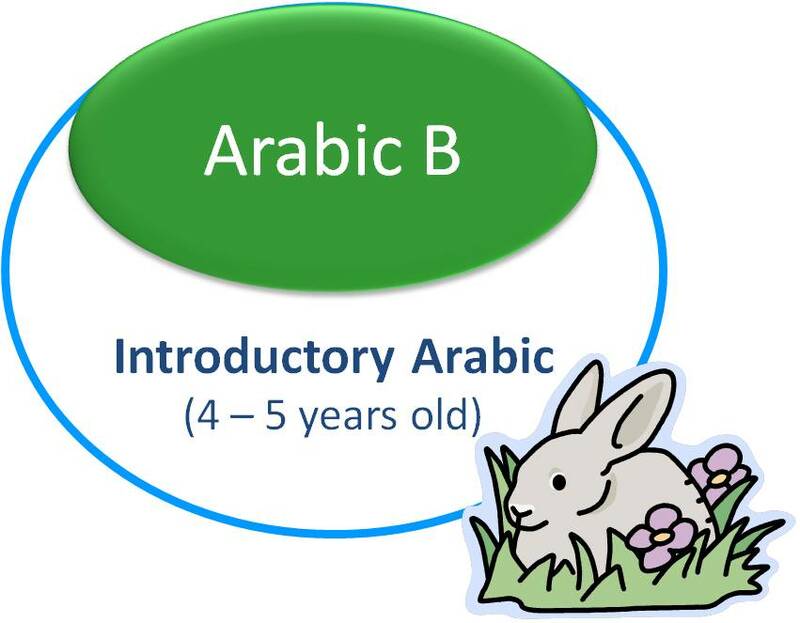 By the end of the course ( two weeks) using interactive methods students age between (7- 9 years) will be able to recognize the first half of the Arabic letters in different shapes, pronounce correctly those letters with short and long vowels, and be able to read simple words and short phrases.In addition, students will practice conversation of basic daily scenarios. 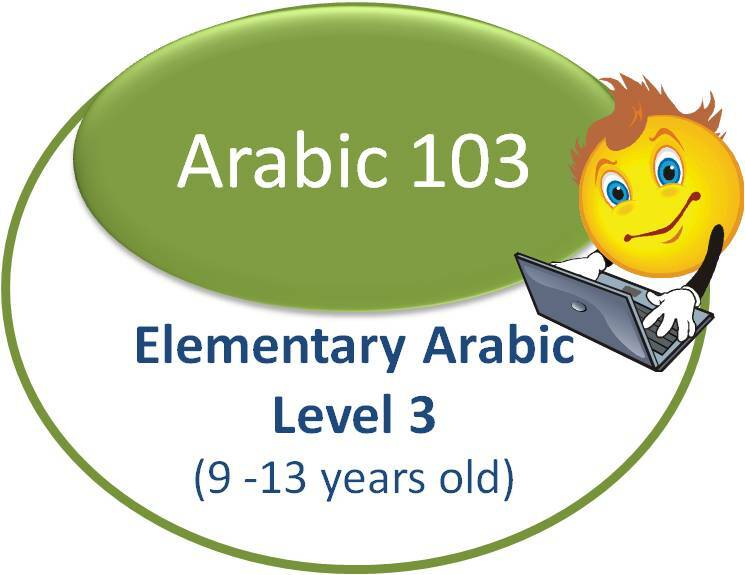 Students age between (10 – 13 years) will be able to write phrases or short sentences using familiar vocabulary with emphasis on Arabic sentence structure and basic grammar.In addition, practice conversation of basic daily scenarios using authentic materials.